Cook and drain linguine as directed on package; keep warm. Mix dressing, lemon peel and garlic; set aside. Spray 12-inch nonstick skillet with cooking spray; heat over medium-high heat. Add shrimp; stir-fry about 2 minutes or until shrimp are pink and firm. Remove shrimp from skillet. Spray skillet with cooking spray; heat over medium-high heat. Add broccoli and squash; stir-fry 1 minute. Add water. Cover and simmer about 3 minutes, stirring occasionally, until vegetables are crisp-tender (add water if necessary to prevent sticking). Stir in dressing mixture; cook 30 seconds. 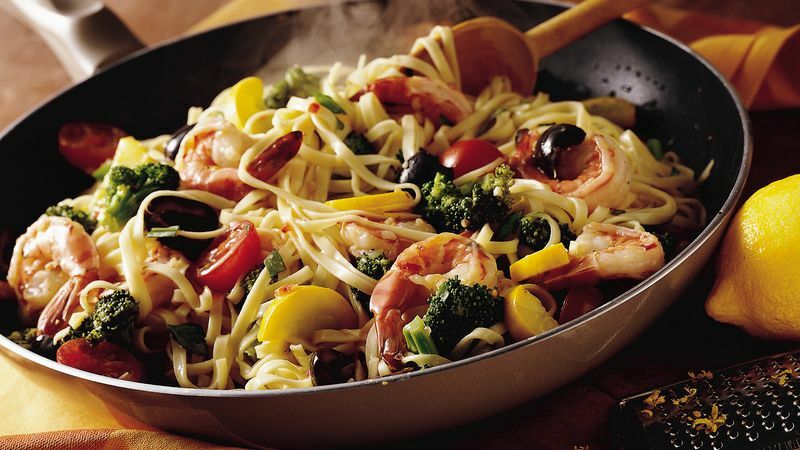 Stir in tomatoes, olives, basil, shrimp and linguine; stir-fry until hot. Sprinkle with cheese. This quick and easy stir-fry was a real winner in the Betty Crocker kitchens. If you prefer chicken to shrimp, use 3/4 pound boneless, skinless chicken breasts, cut into 1-inch pieces. Stir-fry the chicken 3 to 4 minutes or until no longer pink in the center.